WI High School Cycling League is a volunteer based organization and can always use more help! If you would like to help support the WI High School Cycling League, we would be more than happy to accept your help! 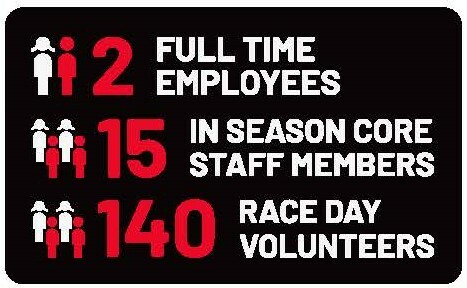 We rely on a dedicated group of volunteers to make our races happen. We value all those who give of their time and energy to help our student-athletes succeed. If you want to be a part of this exciting opportunity, take a look at the positions and get involved! Reminder – all volunteers get a free lunch on race day! Click the SIGNUP.COM BUTTON below and sign up today. Please review the volunteer descriptions listed below or just click on the button below and get started. Build the infield with a team of volunteers and race staff. A well-built infield brings excitement to the event. You will be starting with placing pins and poles for snow fencing and course tape, and possibly erecting EZ UP tents. At the end of the day you will be placing flags and sponsor banners. It takes a full day, so you’ll be working with a quickly moving team. Unlike most race weekend volunteer positions you’ll learn all the skills as you go. Safety is key and we require gloves and eyewear so bring your own or use ours. Announcing invites all racers and all family into the action. This role allows the race announcer to be organized and keep up the energy level. You’ll be giving the announcer all the information he or she needs to announce athletes as they cross the finish line. The announcing assistant needs to be quick as they cross reference rider numbers with names and schools. “Sweepers” add additional communication and emergency support out on the course. We want to ensure that every rider gets to the finish line in the safest way possible. While Sweepers enjoy riding their mountain bike around the course, they must also be willing to ride behind the tail end of a race category and tend to any issues that may arise on the course. Please include a few category choices for your sweeping position. You must be able to keep up with the last rider in that category. Please also check in at the volunteer tent at the time your shift begins, usually about an hour before your category starts, to receive your number plate and attend the sweeper orientation meeting. Please bring your own bike! Course Marshals have an active role in ensuring safety on the course. Course Marshals stand at key marshal points along the course to warn riders of hazards, direct riders, ensure fair play and provide rapid response to incidents. Course Marshals may also act as crossing guards and/or league representatives to other trail users. Radios are provided to communicate report any incidents or to call in medical assistance. A note pad is provided to keep track of any outside support, rule violations and riders who abandon the race. Course Marshal’s can hike or ride bikes to their marshal points. Lastly, remember to cheer on those riders as they pass by! Course Marshals on bikes. Roving Course Marshals keep the entire course safe by reporting incidents and injuries while circling the whole course or a specific area. EMT, ski patrol experience, or advanced first aid training/experience strongly preferred. Please bring your own bike! As soon as the last JV or Varsity rider is off the course, we start take-down and clean up. Volunteers who bring their bikes (and helmets!) take-down the course markings and clean up the course, using packs provided by the MN League to gather up ribbon, signs, and other race-related trash. Nutrition and hydration play key roles in keeping NICA students athletes safe and performing their best on the course. Feeders are often team volunteers doing this team job for their first time. As Feedzone Marshal, you will be guiding all the parent, coach and other volunteer feeders to keep the feedzone the ideal place it is for water and food hand-offs. The Feedzone Marshal needs to have a good understanding of the NICA rules about the feedzone and carries this portion of the NICA rulebook. “Everyone take one step back,” “No running,” and “Only feeders in the feedzone” are a few phrases parents and coaches come to expect from the Feed Zone Marshal. Keep everything running smoothly, but be sure to keep the fun levels high and enjoying being a key role at the feedzone. Finish Line Support Volunteers ensure NICA Student Athletes finish strong and make a smooth transition from competing to reuniting with parents, coaches and teammates. The finish line is often the most hectic and is the most crowded part of the racecourse. Parents and teammates are crowding around to see their athletes finish and athletes come through exhausted, fatigued, and in need of someone to corral them out of the way. Finish line support volunteers allow athletes a clear, safe exit from the racecourse. A quick training session meeting at the finish line will orient you in this unique part of the course. Assist with sales of MN League apparel and product. These items will sit in boxes unless we can get some help selling them. This tent is the hub of information. Course maps, number of laps, Pit Zone layout, Venue questions, and other information is here. Chairs and EZ-Up tents provided! Be the first to welcome NICA student athletes, their families, coaches and supporters as they enter the race venue. Often there is just enough space for our growing League to park, so it’s important to park cars in an efficient manner. After parents park cars you can answer questions while setting the relaxed tone at the race. Be sure to come with layers of clothing appropriate for a range of weather, as well as snacks, water and sunscreen. Greet student-athletes with a smile as they check-in at registration. This is a great way to meet athletes, coaches and parents from other teams. Assist with processing racer registration and handing out numbers. This is a very high-tension area with nervous racers queuing for their starts, and sometimes overly helpful supporters crowding in. Calm but assertive helpers are needed to keep the process orderly so that the races start safely and fairly. The Scoring Assistants provide a critical role to keep track of the action moment by moment using NICA’s proprietary scoring system. The Chief Scorekeeper will guide you and the rest of the team in the positions of Data Entry, Number Caller and Hand Jammer. Be sure to come prepared with appropriate layers for a range of weather, as well as snacks and water – we also recommend a hat and sunglasses. See descriptions below. Scoring Assistant – Data Entry – Listen for finisher bib numbers and accurately enter into computer. 10 key data entry skills a plus. Scoring Assistant – Hand Jammer – Write down finisher bib numbers by hand as back up to computer scoring.